This page features answers to the most commonly asked questions about Meadowlark Log Homes and the log home building process. Don't see your question on this page? The logs have a high level of thermal mass, which translates into very high energy efficiency. 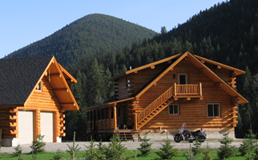 See info on Log Home Energy Efficiency. The log home construction process consists of several steps which are outlined below. The home construction process begins with site preparation, which is accomplished through the Customer's choice of General Contractor or sub contractor. This includes the installation of the driveway, bringing services such as water and power to the immediate vicinity of the actual site of the building, the layout of the septic field if required, and preparing drainage lines. The next step is to excavate for the foundations of the home. These may be simple concrete footings or a foundation wall. Quite often there will be a walk-out or regular basement involved and concrete floors will also be poured at this time. Once foundations are in place the log home package can arrive on site. The selected contractor / builder commences assembling the logs. The Meadowlark Log Homes method is straightforward but a little different than conventional construction. The customer and his/ her builder have access to the Meadowlark factory for advice. This will involve a variety of specialized sub-trades. Each individual contractor should be clear about your expectations and use of materials before commencing work. Needless to say, you should have already obtained a firm contract price at this stage. It is easy for this area to go over budget if expensive upgrades are made at the last minute. Permit requirements vary considerably depending on the local planning authorities. They may include septic, utilities, drainage and energy compliance as well as the actual construction permit. Often, engineering approval is also required. Your construction drawings will meet all normal local requirements and will need to be engineer- stamped in some cases. Contact your local planning authorities to determine the best procedure to get permits approved as smoothly as possible. This may involve a personal appearance by yourself or your builder at a specified time or may simply require submission of plans. Remember the time taken to obtain permits should be factored in to allow a realistic expectation of when you can expect to be living in your new home. Meadowlark Log Homes will work with you through the entire process from purchasing your pre-built log home package to assemembly and finishing of your home. There are several steps to the building process and each is unique to your log home and need to be considered when budgeting for your new log home. One of the major causes of cost overrun are changes made to a building actually in process. If the design is well thought out and incorporated properly into the construction floor plans, this type of problem is minimized. Once you have your budget finalized you will know where you stand. The budget and floor plan are submitted to the lender together with relevant financial information. You will need a qualified builder and a variety of sub-trades to ensure that construction quality levels are met. It is helpful to have trades experienced in the type of home you are building so that they are not learning on the job at your expense. Meadowlark can often assist in the selection process by providing you with the names of contractors involved in the program and sub-trades in your area. This often takes place over an extended period of time as trees, shrubs, flowers and lawn grow in. There are a variety of creative things you can do. It is often worthwhile to make use of a landscaping professional to give you some layout ideas before you start work. Meadowlark is interested in expanding our USA market and also international markets, so the easy answer is yes, we do look for quality people to market our products. To see if it may be right for you, please contact us. We recommend several brands of exterior stain and interior finishes. We carry many of these products, so please contact us for more info or see our stain page here. a. Sikkens SRD Exterior, for exterior logs and decks. Many of our Customers are building a custom home for the first time. Often they have a general idea of what they want but not a finished design. Meadowlark has developed a number of plans showing examples of different styles of homes to stimulate the imagination and help conceptualize the vision. Design development is a process and quite natural. You are encouraged to give free expression to your ideas; after all, it is a custom house that you are building. The final design will evolve as all the important individual components are brought together. We find that most Customers have a certain external style in mind. With our design expertise we can generally meet the specific space and layout needs within the envelope of the look chosen. At our Montana home office, we have representatives who are trained to help you design what you want. Meadowlark Log Homes will put you in contact with design professionals who will work with you to draw your preliminary floor plans and elevations in a timely manner, and then incorporate these into final construction floor plans. The final set of floor plans are highly detailed and will enable you to obtain planning approvals and then proceed to construct your home. The Log Homes Council is an organization formed in the 1980's to be in the forefront as a voice of our industry. It provides guidelines of quality and trains and certifies its members to grade and structurally stamp the logs. It is made up of members such as Meadowlark Log Homes. We are glad to say that all of the logs in every Meadowlark Log Home, are graded and stamped according to these high standards. Absolutely! Meadowlark Log Homes is a member of the Log Homes Council, and is certified to structurally grade stamp each and every log. This is an internationally recognized grading program, so that our log homes can easily be exported and re-assembled in other countries which have open trade policy with the USA.